Self-Sealing paper bands wraps the product from one end to another end and with the help of this, products are systemized and channelized in place during the transportation process, storage and in other medium. Changing viewpoint of people towards more ecofriendly packaging led the companies to focus on environment friendly and groundbreaking products, and hence self-sealing paper bands came into existence. It is made up of biodegradable material i.e. paper which is eco-friendly in nature and it also decrease the packaging cost, reduce the weight and transportation cost. Cohesive self-paper bands require no extra thing; it just requires the pressing of the ends. This help to increase the bindery productivity up to 60% and also provide the printing facility. It is widely used by key vendors of e-commerce industry, industrial sector, shipping and logistics. Self-sealing paper bands market is anticipated to reach at a significant figure by 2027. Moreover, the market is anticipated to flourish at a CAGR of 3.2% during the forecast period. Global self-sealing paper bands market is segmented into coating area, coating type, by material type and end users. Regionally, global self-sealing paper bands market is segmented into North America, Europe, Asia Pacific, Latin America and Middle East & Africa region. 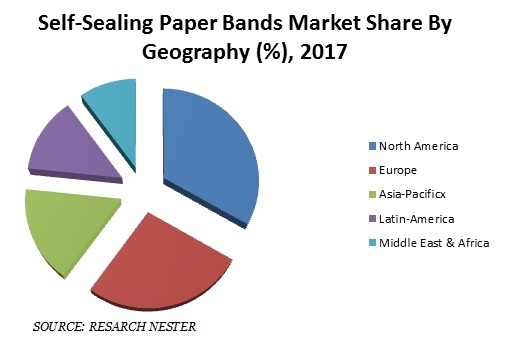 Among these regions, North America accounted for the largest share in overall self-sealing paper bands market in 2017 and is likely to continue its dominance during the forecast period i.e. 2018-2027. Growing consumption of packed product & wide scale utilization in fashion & apparel industry are some major factors which are envisioned to escalate the growth of self-sealing paper bands market in North America region. Further, Europe is the second leading market of self-sealing paper bands and is anticipated to grow at a remarkable pace during the forecast period. Factors such as rising consumer preferences for self-sealing paper band products and growing use of recycled latex coated bands are likely to foster the growth of Europe self-sealing paper bands market during the forecast period. Mounting sale of self-sealing paper bands across the globe has given a commendable impression in the people’s mind and their buying behavior. It is increasing the demand for ecofriendly latex coating among customers. Owing to this trend, use of plastic is believed to dwindle in upcoming years. Self-sealing paper bands is convenient, ecofriendly and sustainable. These factors are believed to spearhead future market growth. Further, ease of handling and packaging is the key factor driving the market growth. It is also being used as an alternative of stickers and wax gum. In near future, demand for self-sealing paper bands is believed to rise and leave a blameless impression on the account of growth in demand for industrial products. Furthermore, new generation prefers innovative product packaging which may leads to positively impact the growth of packaging market in future. Self-sealing paper bands are a prodigious option offered in the market which is easy to use and dispose. In addition, this packaging has extraordinary performance advantages as compared to other packaging methods and is projected to drive market growth in future. Other factors that are driving the growth of the market are the growing awareness among the consumers to utilize environment-friendly products and ease of usage of the self-sealing paper bands. As these products are made from biodegradable material, the consumers mostly prefer the self-sealing paper bands over the plastic packaging solutions. The manufacturers are finding the self-sealing paper bands packaging solution effective as it helps in minimizing the packaging costs, reduces the weight, and the transportation cost. However, limited application of self-sealing paper bands is anticipated to dampen the growth of the market.